Dryandra are a small growing shrub ranging from ground cover plants to 2m in height. The low growing Dryandra nivea is one of the most popular species for garden use, commonly called the ‘Couch Honeypot’. They are related to banksias and have similar growing requirements, they are native to Western Australia. 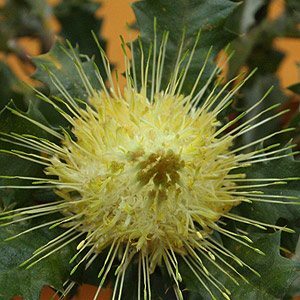 A few name changes here for example Dryandra quercifolia syn Banksia-heliantha. Dryandra prefer a dry climate, a well drained soil and full sun. D. proteoides grows to about 2m. D. formosa which grows to become a medium sized shrub with yellow flowers in spring. D. nivea works well as a ground cover, dark green foliage and in spring, attractive yellow flower heads . D. quercifoli and Dryandra longifolia are worth considering. Natural Habitat – Full sun, well drained soil. Height – Variable height from 1 -5m depending on species and soil and conditions. Foliage – Holly like, mid to deep green. Flower – White to Yellow. Conditions – Well drained soil..
Landscaping Uses – Can be used as a border plant or as a low screen.